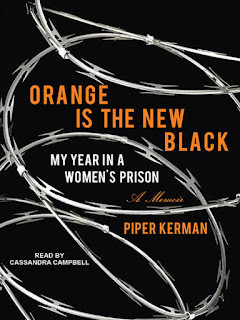 After hearing several people talk about the miniseries Orange Is The New Black by Piper Kerman I decided to borrow the audiobook from the library, read by Cassandra Campbell. Fortunately I have not seen the show based on this book, as it is apparently using only the title as a springboard for creative screenwriters whose aim is to produce a compelling series. From the start I found the book well written. The opening chapter does what all good stories do, it hooks the reader and makes him or her want to keep turning the pages. 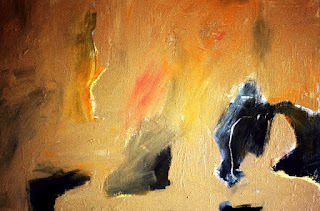 Kerman's story seems to be a frank account of how a young, carefree young person makes life choices that have serious consequences beyond anything they could have imagined. Midnight Express comes to mind here. In Kerman's case she got involved with a woman who was part of an international drug smuggling ring. Exciting times in exotic places seemed the story of her life, until it came time to pay and she ends up in the women's federal prison in Danbury. There are more than four thousand reviews of the book on Amazon.com with 46% weighing in at five stars. But there are ample quantities of negative comments. Some found the book boring. Some didn't like the narrator like this one who states, "Didn't everyone really go to high school with Piper Kerman? She is just the stereotypical, little, mean-girl, blonde, who was born with a silver spoon in her mouth. She makes an absolutely abysmal life choice, that she shrugs off as happening due to her being bored and adventurous, even though life has given her every advantage, and after 11 years finds herself dropped into the middle of the cesspool that is the American prison system." I myself listened to the book as a writer, assessing all the decisions Kerman made as she told her story. The author had a delicate dance to do here. How frank should she be about her life choices? It would appear that she puts it all out there. Some say that she made the prison seem too much like a women's summer camp and not so bad, but it's clear from the numerous references to the challenge of keeping one's sanity and dignity that this was not a joyous picnic. One of the criticisms of the book is that it's not as interesting as the television show. Well, the TV show doesn't have to be faithful to the facts. 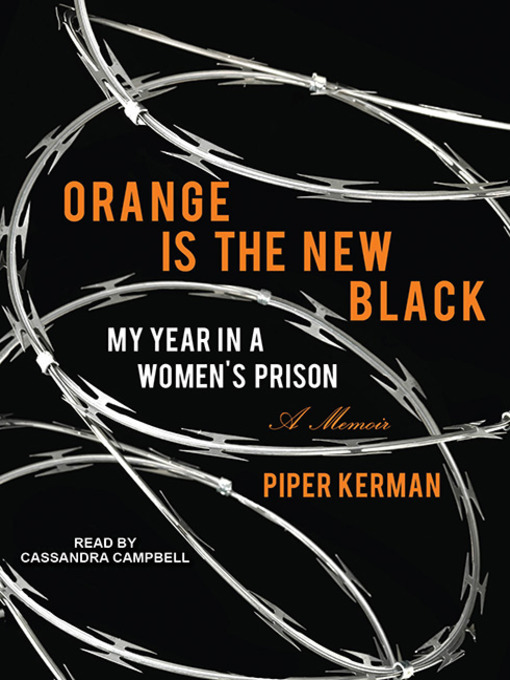 It can draw from all the stories ever experienced in women's prisons and while using Piper as a central character that serves to hold the stories together. There were no murders at Danbury the year she was there, for example. In fact, it would seem the biggest excitement was the possibility of Martha Stewart becoming an inmate there. I agree with the Amazon reviewer who wrote, "It is written like a series of sequential articles rather than a narrative with true character development, but it still provides interesting insights into the rhythm of institutional prison life, with its mind-numbing bureaucracy and its mash-up of humanity trying to adapt or deal with incarceration. It is told from Kerman's pov, and thus her reactions to life in prison make up the bulk of the book, but she still provides a lot of food for thought about our prisons and the people who live in them." It's clear throughout the book who has the power and who doesn't in a prison setting. The humiliation of being strip-searched or periodically groped has no recourse. And the ever-present threat of being sent to the SHU (Security Housing Unit, better known as solitary confinement) is a recurring theme throughout. The SHU comes up repeatedly as an ever-present reminder that you are an insect in the system. The women at Danbury come from all walks of life, but there is a predominance of the poor -- black, Latino and white. Kerman is a college grad who had it good, but wound up in the tank. She had a boatload of support from her fiance, friends and family, and it was clear she had good prospects for her life after release. This is not the case for many, if not most, of the inmates she did time with. Having just finished the book this morning, my fresh take here is that Piper Kerman has had an unusual experience that brought her many new insights about life, not only hers but the lives of others. I believe the book worth reading not only for hearing what prison life can be like but also for the insights she gained from the experience. One of those insights was the observation that prison doesn't seem to be about helping people get rehabilitated. It's simply a form of punishment carried out with indifference by people who are simply performing a job. And kudos to Cassandra Campbell for her reading. She did an admirable job in cnoveying the personalities of the various characters we encounter along the way. Great review, Ed. I enjoyed the book and am still watching the series!